Zinc is an excellent roofing and cladding material which will give long and almost maintenance-free service if installed properly. Proper installation means not only the correct fixing of the zinc roofing itself, but also the correct design and installation of the supporting structure. In traditional roofing and cladding this structure provides a continuous support for the zinc sheet roofing, whereas in engineered façades, metal railing and point fixing systems are employed. The information provided in this section can be used as a guide to the basics of zinc roof construction. Please also consider local compliance requirements. We are always happy to assist with appropriate guidance and technical support to meet such requirements. 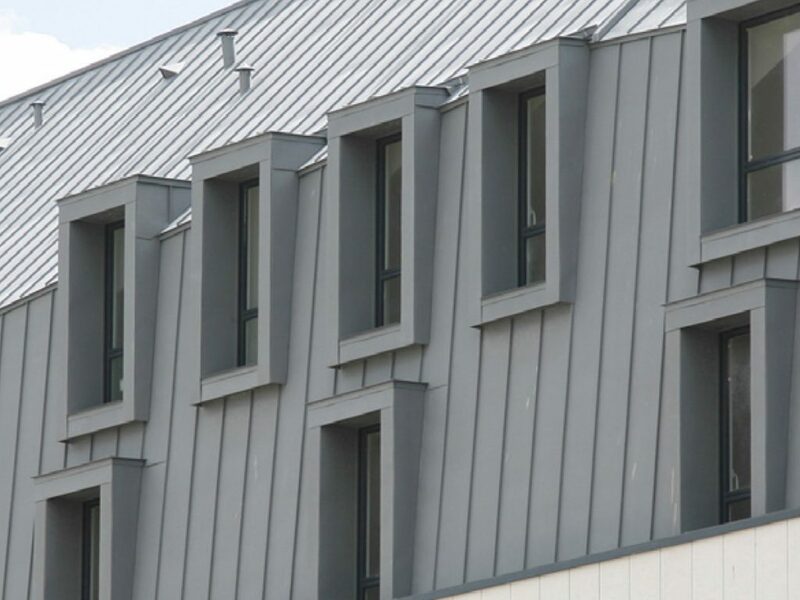 Traditional zinc roofing systems are fully supported metal coverings that employ tried and tested hard metal seaming techniques. Zinc roofing systems, such as standing seam roofing, flat lock or zinc shingle roofing systems and zinc tiles fall into this category. The complete elZinc® range of finishes can be installed using these systems and we are always happy to assist with zinc roofing detail drawings, product information, and installation guidance. These roofing systems are installed by standing seam metal roof specialist contractors. 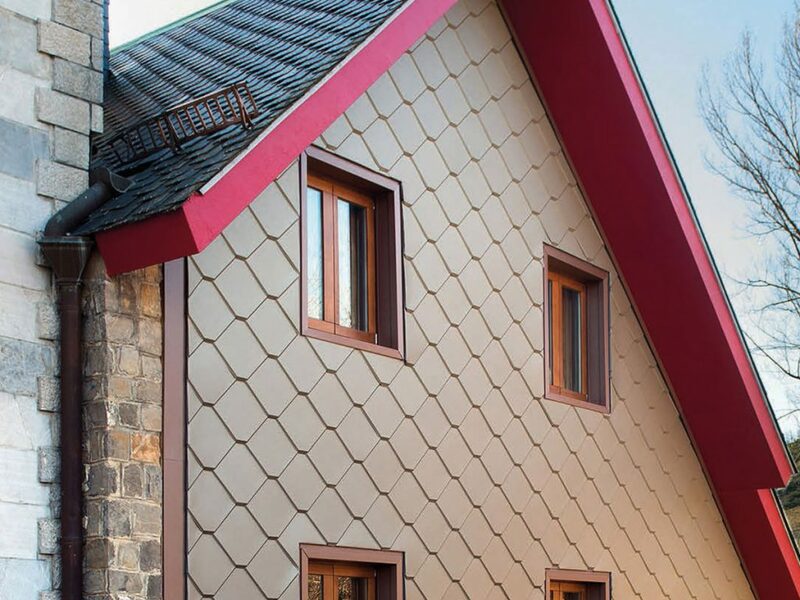 These zinc roof specialists offer a hand crafted, made-to-measure feel. The subtle quilting of a standing seam metal roof can become apparent naturally under different light conditions introduces a bit of visual ‘vibration’ and ‘energy’ to the building. Zinc roofing should only be installed by experienced standing seam metal roof installation contractors. Zinc standing seam roofing has been known to last for well over half a century, and is the ideal choice when life cycle is a priority. The thin gauge of elZinc® zinc roofing sheets (0.65 to 0.8mm – only 5,6 to 7 kgs/m2) coupled with modern bending and profiling technology keeps costs more affordable than most architects appreciate. Zinc roofing sheets, between 0.65 and 0.8mm are normally used since these systems require ease of hand forming on site to execute the standing seam roofing joints and details. 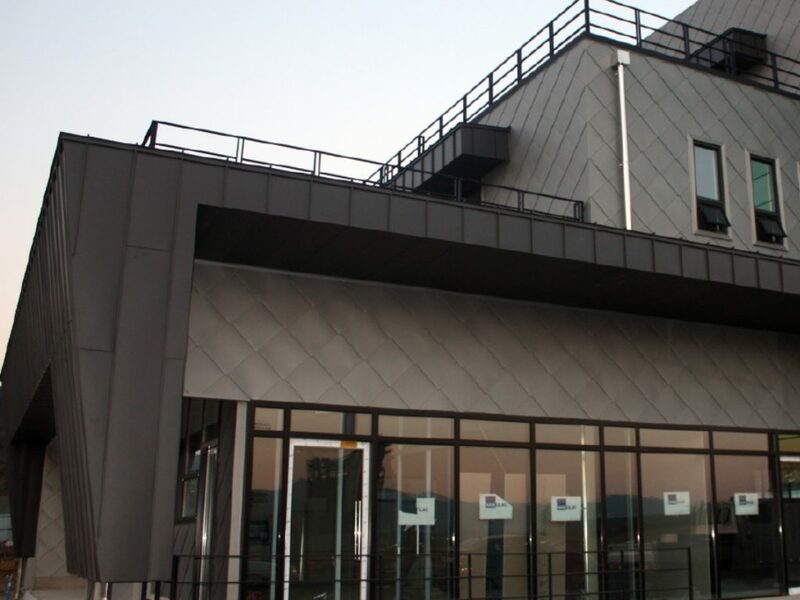 In countries new to this type of cladding, there is a temptation on occasion to use heavier gauge zinc roofing to eliminate oil canning, but this should only be done after consultation – many standing seam metal roof joint details cannot be executed in material thicker than 0,8mm. These zinc roofing joints create protruding seams or small steps between the zinc sheet roofing or standing seam roofing trays. They are either simply interconnected or welted together on site. The seams are not watertight, and their weathertightness varys, so each type of joint has its own pitch-related limits. Optically, these joints interact with the light generating interesting effects which can influence our perception of the façade at different times of the day and year. Traditional zinc roofing fixes are hidden by being overlapped by the next panel in the sequential installation of the covering. They hold the cladding down to the substrate whilst ensuring it can expand and contract freely as it warms up or cools down. Due to the thin gauge of the zinc roofing sheets used, they require a fully supporting substrate. This can either be of a vented or unventilated design, and helps reduce rain drumming especially if combined with structural underlays. These systems should always be installed per local and national building code requirements. Independent system certification should not be required since these zinc roofing systems employ tried and tested techniques and methods. Zinc Iberico are always happy to assist with guidance and technical support.